Cassata Siciliana The cake is a traditional Sicilian cuisine made from Ricotta cheese, sugar, cake, candied fruit and marzipan, although there are many variants, inter alia, can add ingredients such as chocolate, pistachios,.. The version I suggest I take marzipan, I have substituted for candied candied fruit, and I added a fresh fruit that is in season, cherries. The truth is that I am particularly pleased with the coverage of the pie, seeking is the thickness and texture that was quite perfect, but was not matched, smooth, as you can see. Make a chocolate frosting, thick and smooth, is a skill that I have not yet reached in pastry (like many other … eggs) but good, the idea of ​​how I think it may be well presented on the cake is this. I hope you enjoy it and, good, in taste itself…. Wonderful! We started preparing the cake. To do this we covered greased and the base paper baking mold 18 cm. Here, I must confess, I made two cakes to make three-story, I'm really afraid for the moment of cutting the layers and I think I'm capable of doing fine without me break (I've never tried either. As I, no me atrevo.. eggs). Sift flour, cocoa and baking powder in a large bowl. Add the butter, sugar and eggs and whisk until smooth and creamy paste. Pour the mixture into the prepared mold and bake had, in preheated oven at 190 º C, about 50 minutes or until risen and when pierced with a stick comes out clean. Once we leave out of the oven about 5 minutes before removing the mold and let stand in a grid (I leave a photo of the cake at this time. Alone is a delight). Spent to develop the filling. This black grate the chocolate and add it, along with sugar and liquor, the annealed. I beat them all, with manual rods, in a bowl. Then we add the candied fruit and nuts and mix well. We started mounting of the cake. This will match the top of the cake cutting off the forelock. Then the rest rebanamos 3 layers. Fill with ricotta cream and let the three cake layers a couple of hours, at least, in the refrigerator. Finally we make the coverage. This left the cream at room temperature for half an hour before using (if too cold, when mixed with chocolate, it would be lumpy). Next, Melt the chocolate in a bain marie, and when it is warm add the cream and beat with a whisk by hand. 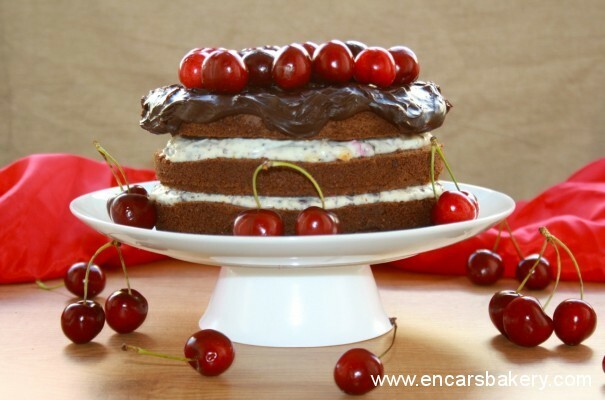 We took the frosting on the cake to cuacharadas, let it cool slightly and add the cherries (washed and tail) to our taste. We return the cake to the refrigerator until half an hour before going to taste. 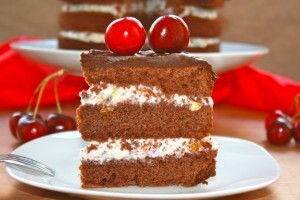 I encourage you to make this cake as you can or when you find the right opportunity, Great!, you'll love. See you soon .. See you soon !! Well Incarnation, coverage and you have been precious cake!!! !With how difficult it is (for me ) fill layers do so chubby I think you made a cake 10. What paints!!! I've always called attention to this cake. The truth is that it looks great and should be delicious. Vista has , that maravillaa!!! Who is not going to like something like?, not me of course, because I love mi!!!! Riquísima seems!,Wilton I have some molds that I can use to make this delicacy. You look great, I love. Just last night I came across a recipe for Sicilian casatta. I like yours. I love the filling you have put. Kisses. Guauuuuu that peazo of tartaza!! 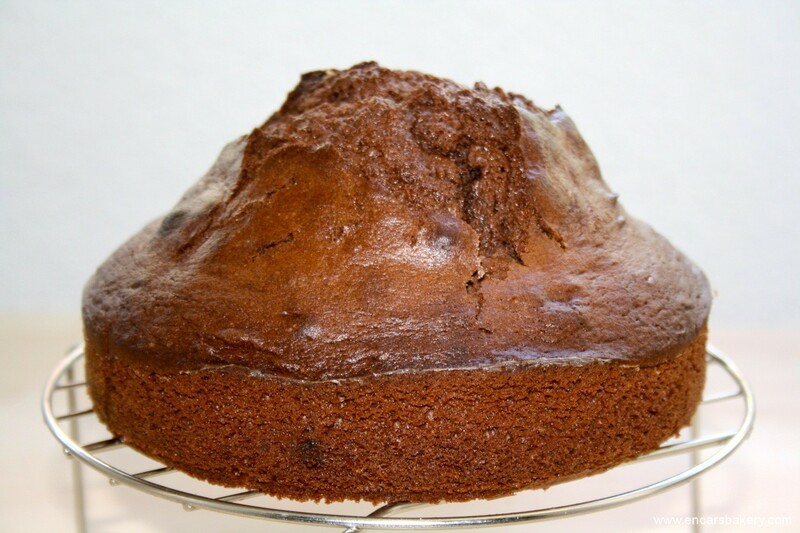 I'm crazy about the cake with this supercopetón!and I'm also a little afraid to make very thin layers of cake in case I break…..although one day have to try! Incarnation Hey I see her great coverage! why do not you like, because it is not smooth? it seems to me that with cherries on top and looks great! I have a cake that I made before yesterday still to be published, and takes all her a chocolate coating, is not made like yours, might help you my recipe. See if the public soon! What a wonderful, I think spectacular, and coverage seems perfect not see any problem, I love! Encar! I find supreme! I love rustic finishes but this leaves you open your mouth when you see. I have really wanted to try the ricotta cheese in pastry, I can not lose! A great and perfect cake, but there is always the fault @ cociner . We are our toughest critics and that's. good. It always breaks my cake when cut because I do not expect too big and the next day to manage. I coverages to put my chocolate cream and a tad of butter all together micro, I remove it and heat up and coverage is smooth and shiny. It has a perfect pint, even if you think the coverage is not how you'd wanted to, but the truth, if you are rich, which gives more! I just eat it. I have been of the most beautiful with those cherries. Mother, to repeat and do not stop. Mortal chocolate cake and ricotta filling, mmmm! What you get recipe envious friend of mine this week…delicious, golozos fresh and unique to the mix .. that rich chocolate .. that coverage, the fill…I looked good and I have already pointed to my challenges, is the only thing I can say. It's amazing…..I've dazzled…as the sun ..!!!! I'm glad you liked it, nonetheless.. haha Me too I like “home issues” but it is clear that the more perfect fit you are the best finish photos.. In the end, a professional baker and not doing what it can :), and the important thing is that it is a good recipe, and this is what. Encar! I had missed your casatta! what is more rich! I loved!